The Abu Garcia Abumatic Closed-Face Spincast Reel has been beefed up with features you’d normally only see in a premium baitcaster. Now, you have that same high level of performance, plus the no-hassle convenience of a closed-face spincaster, precision-engineered for those who just love the perfect cast. S-Matic snubberless casting system increases casting effectiveness and lessens line wear that makes it easier for you to maintain a pristine cast. The QuadCam Pickup System delivers fast line pickup during your retrieve, and combined with the Ultra Smooth spool drag system will deliver you a hard fighting cast. Abumatic Spincast has a four-bearing system delivers smooth performance. The aluminium frame and cone reel comes pre-spooled with 8lb-test Berkley Trilene XL monofilament line, and you can easily switch between right or left-hand retrieve. Abu Garcia Abumatic Reels are designed for fishing when you need casting accuracy. Great when you are fishing in places like rivers, lakes, dams and in large ponds. 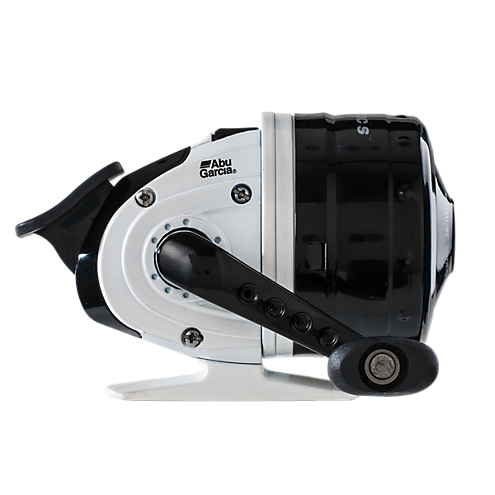 A good all-round fishing reel.